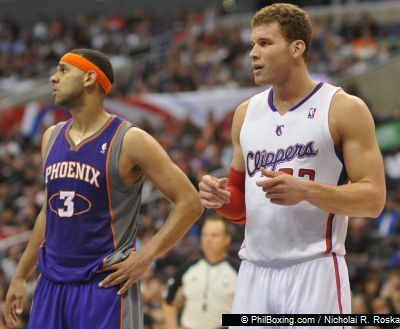 LOS ANGELES -- It was billed as a match-up between two of the top point guards in the NBA. A duel between cagey veteran and two-time MVP Steve Nash of the Phoenix Suns versus the young lion in Chris Paul of the LA Clippers. But when the lights went on, it was a hard-charging, red-headed power forward who stole the show. And what a show it was. Blake Griffin powered and dunked his way to 27 points and 14 rebounds Wednesday night to lead the Los Angeles Clippers past the visiting Phoenix Suns -- 103-86 -- before a sold-out crowd of 19,060 at the Staples Center here in downtown Los Angeles. Nash and Paul didn't disappoint, either. And while both sentinels handled their point guard chores with admirable ease, it was Griffin who provided both the highlight reels and the muscle to turn a closely-fought contest into a second half rout. A stiff back rendered Nash far less agile than he'd like to be. The future Hall-of-Famer was held to just one point, but he guided the Suns offense with 15 assists. Paul, meanwhile, was healthy. And that meant wealth in his production. Paul finished with 15 points, 15 assists and 5 rebounds in 37 minutes of action. Top photo: Chris Paul and Steve Nash. Photos by Nicholai R. Roska. It was a nip and tuck first half, where the lead changes swung like an errant pendulum. But after clinging precariously to a 43-41 halftime lead, the Clips delivered a near-fatal blow when they outscored the Suns 31-23 in the third quarter. The knockout punch came late in the final stanza when Griffin and company opened an 89-74 gap. Caron Butler and DeAndre Jordan combined for 27 points for the Clippers, who shot 41-of-82 field goals (50 percent), 7-of-19 treys (36.8 percent) and 14-of-23 free throws (60.9 percent). 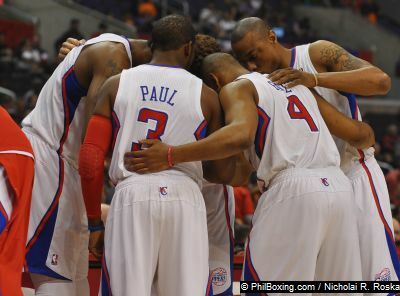 The Clips had more turnovers (12-10) but they won the rebounding battle, 48-40. Marcin Gortat led the Suns with 23 while Channing Frye added 16. Jared Dudley, Robin Lopez and ex-Laker Shannon Brown each had 10 for Phoenix, who shot just 30-of-80 field goals (37.5 percent), 5-of-26 triples (19.2 percent) and 21-of-32 free throws (65.6 percent). The Clips improved 29-21, 4th overall in the West standings while the Suns dropped to 25-26, two games behind the 27-24 Houston Rockets for the 8th and last playoffs berth.